I finally saw “Hamilton” at the Kennedy Center. Yes, it was a road show, where the singers cheated on the high notes and the very pretty fellow who played the title role kept blending into the scenery. Oh, but the actor who played Aaron Burr made me believe the show was named after him! A fine production viewed from a fine seat on the first balcony. The night before, I was at a different theatre, seeing an old favorite: “The Pirates of Penzance.” It, too, was a touring production from a pair of Chicago theatre companies – The Hypocrites and The House Theatre. The reason: the decision to put the audience at the heart of the action. The experience began the minute you walked through the theatre door. Every cast member was onstage, singing not Gilbert & Sullivan, but beachy standards like “Sloop John B” and “Margaritaville.” A tiki bar was located on one side of the stage and remained open for business throughout the entire show. A batch of beachballs were flying overhead – audience members batting them at actors, musicians, and each other. I thought I was at a Dodger game. The audience – an equal mix of senior citizens, 20-somethings, and parents with dozens of very small children – was invited to take a seat onstage. Oh, sure, some of us fuddy duddies sat on chairs safely away from the action, but most of the audience was happy to plop down on painted wooden benches and ice chests and kiddie wading pools that filled the stage. They were instructed that whenever the action moved to the exact space where they were seated, they’d be politely tapped on the shoulder. This was their invitation to get out of the way. Fast. At times, it looked like a giant game of musical chairs as grownups and kids scrambled to find another seat. Several members of the audience were recruited to actively participate in the play by holding up the Union Jack or the skull and crossbones of a pirates’ flag. Each was printed on giant beach towels. Parasols were handed out to young ladies who dutifully twirled them this way and that, trying to keep up with the cast member. The smallest of kids congregated atop the lifeguard station at stage center. It was a magnet for them. Rather than making them scoot, the actors acknowledged their presence. The Pirate King and Frederic would declare that they were entirely alone – and then roll their eyes at the 3 year olds who surrounded them. The rest of the audience was delighted – when they weren’t scared half out of their wits that one of those toddlers would fall off the platform. The evening was amazing. The energy bounced off the walls. What a pity when those youngest of audience members discover that all theatre isn’t like this. Which makes me ask: why not? Playwriting can feel like such a selfish act. Yes, we have “important stories” that we believe must be shared with the world. But they are our stories. We hope they will resonate with the world in some way, and sometimes they do. (A young man told me that seeing my war crimes play “A Patch of Earth” was the reason he became an attorney specializing in international law.) But usually, it’s a bunch of people sitting in the dark watching a bunch of actors pretending to be imaginary people we made up. I’ve been thinking hard the past week about the role of the audience in theatre and what I can do as a playwright to make the theatrical experience more about US and less about ME. I have no immediate solutions, but just asking the question is a start. So I’ll also ask it of you: is it our responsibility as playwrights to also consider the audience? How can we bring them into the theatrical experience? Do we want to? Does the audience want to? How does that change the work? The mission statement of The Hypocrites is to “re-introduce communal connection into contemporary theater by embracing the desire of all people to bond with each other, especially while experiencing the same event.” The House Theatre wants to “explore connections between Community and Storytelling through a unique theatrical experience.” What’s my mission statement as a playwright? 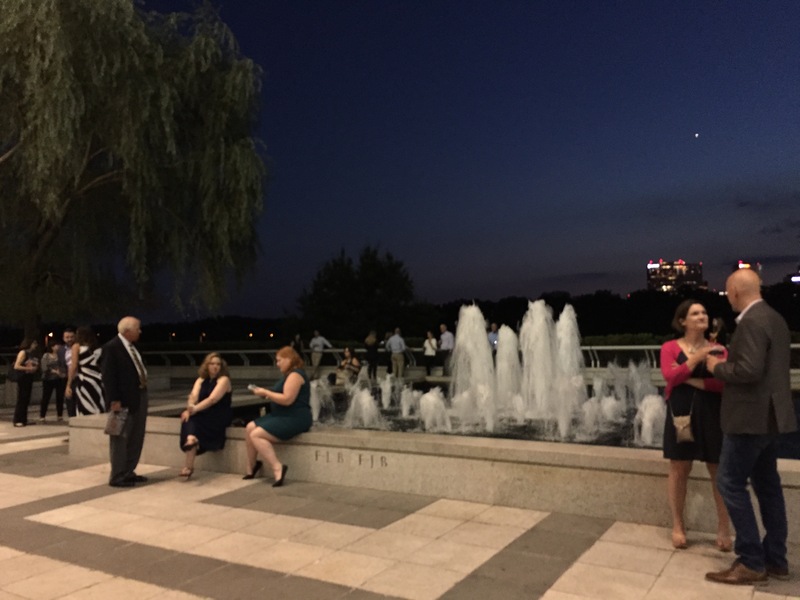 Most of the Kennedy Center audience was as familiar with the lyrics of Lin-Manuel Miranda as the actors onstage. Here and there, you could hear someone two seats over whisper, “teach ‘em how to say goodbye, say goodbye” or “never gonna be satisfied.” We all wanted to sing along. It was a show that did speak to us personally and we wanted to be part of it. But we were at the Kennedy Center, not a black box theatre in rural Maryland. We knew that if we broke into song, a gray-haired, red-coated usher would find us and take us away. Now that I’ve seen this production of “Pirates,” I’m never going to be satisfied to sit quietly in the dark. Playwright Kitty Felde is also host of the award-winning Book Club for Kids podcast. Her play about the LA Riots “Western & 96th” will be workshopped this September at DC’s Spooky Action Theater and its New Works in Action series.